Zanesville is the county seat of Muskingum County. Ebenezer Zane founded Zanesville in 1800. The village was located at the junction of the Licking River with the Muskingum River. Zane had built a ferry service at this place for people traveling along the frontier road known as Zane's Trace. By the War of 1812, the town had approximately 1,400 people. It became the Muskingum County seat in 1804. 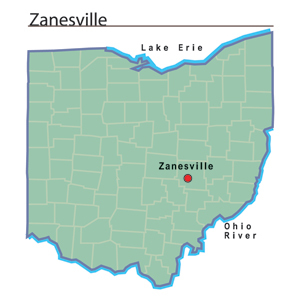 In 1810, Zanesville replaced Chillicothe as Ohio's capital city. The main reason for this change was an attempt by Democratic-Republicans in Ohio to solidify their control over eastern Ohio. The capital remained in Zanesville for two years and returned to Chillicothe in 1812. A new state capital was established in Columbus in 1812. The Ohio General Assembly met for the first time in Columbus in 1816. Zanesville became an important commercial center in the region, with a number of skilled craftsmen and small shops located in the town. Businesses manufactured soap and candles, and the pottery industry capitalized on the plentiful clay in the region. In 1846 seven iron foundries operated in Zanesville, as well as one cotton mill, five flourmills, four sawmills, two oil processors, and one paper mill. Because of the city's location along Zane's Trace, the National Road, and the Muskingum River, Zanesville's thirty stores carried a wide variety of goods during the 1840s. The most important industry in Zanesville during the second half of the nineteenth century was art pottery manufacturing. Samuel A. Weller became the community's most important manufacturer in 1890, when he began production in Zanesville. Most of his early products included simple items like flowerpots, cuspidors, and tableware. By 1905, more than five hundred workers were employed in Weller's plant. These workers produced three boxcars full of pottery every day and made Weller the largest manufacturer of pottery in the world by the 1910s. During the late 1800s, most art pottery was hand painted. Many manufacturers ended this practice before World War I and preferred to use faster machines. Weller continued to use hand painting until the 1930s. Due to the Great Depression, Weller Pottery ended production in 1948. Pottery manufacturing remains a vital component of Zanesville's economy today. In 2003, many of the city's more than 27,000 residents found employment in various pottery establishments, including Fioriware Art Pottery, Zanesville Pottery and China, Incorporated, and Robinson Ransbottom Pottery in nearby Roseville. Other businesses in the community include Volvo Trucks and Custom Vans of Zanesville.